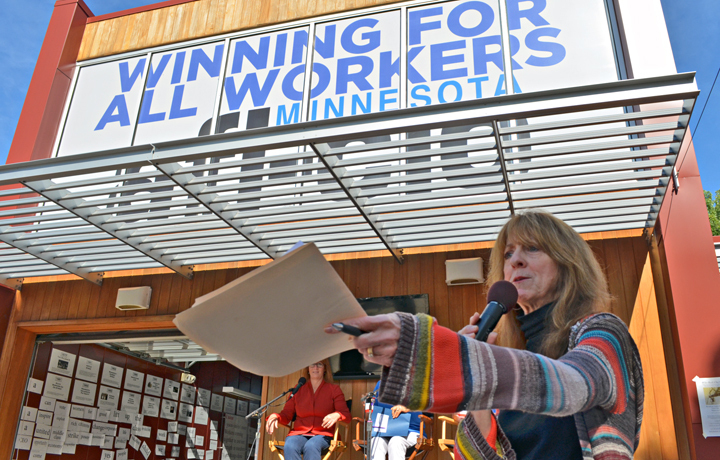 Sue Scott, a union performer who appears on “A Prairie Home Companion,” moderates a panel discussion on women’s economic security at the Minnesota AFL-CIO Labor Pavilion. On the 94th anniversary of women’s suffrage in the U.S., a panel of three state lawmakers from the East Metro discussed the gains women workers in Minnesota made with passage of the Women’s Economic Security Act this year – and the work for equality that remains to be done. 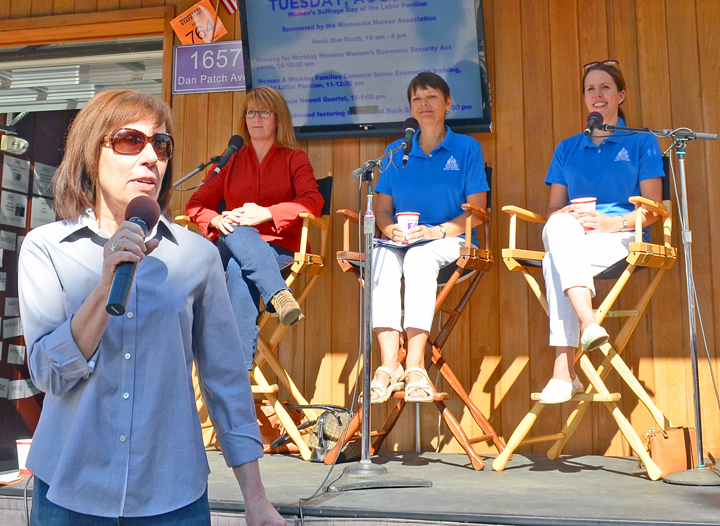 Sen. Sandy Pappas of St. Paul, chief Senate author of the Women’s Economic Security Act, joined Sen. Katie Sieben of Newport and Rep. Erin Murphy of St. Paul on the panel, hosted by the Minnesota AFL-CIO at the Labor Pavilion on the State Fairgounds today. The primary goal of the legislation, the DFLers agreed, was to eliminate the gap between what women and men earn for doing comparable work. In Minnesota, women earn 80 percent of what men earn, Pappas said. For women of color, the gap is even larger. The new law tackles pay equity in a number of ways. It requires businesses with more than 40 employees that have contracts with the state of $500,000 or more to comply with the state’s equal pay laws. The law also makes it illegal to prohibit workers from discussing their compensation with other workers. Sieben said the measure empowers women workers to root out wage inequality on the job and demand parity with their male colleagues. “Ability to discuss pay should help narrow the pay gap,” she said. Minnesota AFL-CIO President Shar Knutson introduces state lawmakers (L to R) Erin Murphy, Sandy Pappas and Katie Sieben. Although not part of the Women’s Economic Security Act, raising the state’s minimum wage is another step forward for women workers. DFL majorities in the Legislature and Gov. Mark Dayton passed legislation to raise the minimum wage to $9.50 by 2016 and adjust it annually for inflation each subsequent year. “It certainly will do a lot … in the years to come for women in the state,” Sieben said, noting that women make up the majority of workers earning $9.50 per hour or less in Minnesota. Women and men with the same level of education and work experience should have the same earning power, Muphy said. But too often, women fall behind their male colleagues because they are perceived as less dedicated to their career than their families. “We need to make sure women who chose to work don’t get dinged because they’re pregnant, don’t get dinged because they have a family, don’t get dinged because they’re nursing,” Murphy said. To that end, the new law includes protections for mothers and pregnant women, and it requires employers to make accommodations for women who are nursing. It also expands unpaid parental leave for women and men to 12 weeks. The law also provides funds to help women start small businesses, to study gaps in retirement savings between men and women, and to recruit and train women for jobs in fields where they are underrepresented. That includes careers in the construction trades, where, if they work union, women are guaranteed to earn the same wage as their union brothers because they have the protection of a collective bargaining agreement, Pappas noted. All three lawmakers agreed the Women’s Economic Security Act was just another step toward achieving gender equality in workplaces across Minnesota. While the new law expands parental leave, it remains an unpaid benefit. Pappas said she’s committed to ensuring paid parental leave for Minnesotans, adding that the U.S. is the only industrialized nation that does not guarantee paid parental leave for its workers.